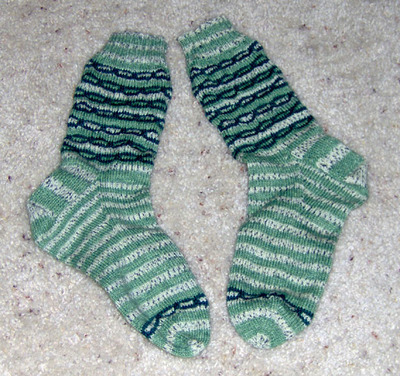 March 22, 2007 by Carol B.
I am happy to announce, that the Chain Link socks are finished. It’s taken almost 4 months and I’m sure you were getting tired of hearing about them. I don’t know how I managed it, but they are identical and I wasn’t really trying. Now I can work full time on the Tidal Wave socks. Pictures coming soon. too cute for words! great job! OK – AT THIS RATE YOU CAN MAKE ME 3 PAIR A YEAR!!! !